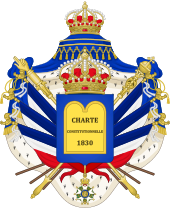 The Peerage of France was recreated by the Charter of 1814 at the same time as the Bourbon Restoration, albeit on a different basis from that of the ancien regime before 1789. A new Chamber of Peers was created which was similar to the British House of Lords, and it met at the Palais du Luxembourg. Like the House of Lords, the Chamber of Peers had a judicial function, being authorized to judge peers and other prominent people. As such, it judged Marshall Ney to death. Louis-Marie-François de La Forest Divonne. This page was last edited on 13 July 2018, at 00:38 (UTC).